The William Jewell College ballroom dance team is hosting Spring Fling, one of their semi-annual balls, April 18 from 7 p.m. to 10 p.m.
Jeri Mickle, ballroom instructor and owner of One Step At A Time, said the event will feature performances from the WJC ballroom dance team, members of One Step At A Time studio and the William Jewell Jazz Band. Shaneann Fross, sophomore Oxbridge Molecular Biology and Applied Critical Thought and Inquiry (ACT-In) major, spoke about why she is excited for Spring Fling, where the team will be performing a triple-time swing routine. “I’m looking forward to the routine. We’ve been working on the routine for quite awhile, since the beginning of the semester, and it’s finally looking not bad,” said Fross. Fross has been involved in either the class or team since her freshman year when she signed up for the team because she’s always wanted to learn to ballroom dance. “This year in particular, I’m finally getting to the point where I know how to dance to almost every single style, so I’ll be able to lead or follow someone in every single song,” said Fross. 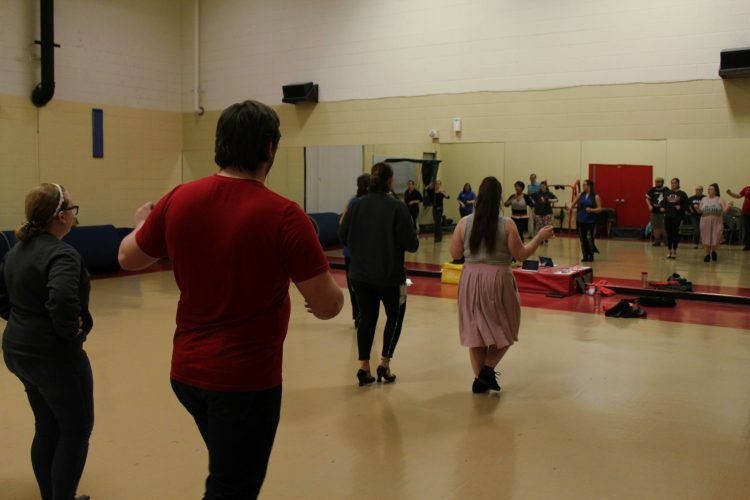 Ballroom dance is a long-standing tradition at Jewell. Dr. Will Adams founded the program at Jewell and formed an official team in the fall of 2014. Adams invited all students who had participated in a ballroom class to join the team at that time. This included Leilani Seaborn, Jewell alumna and current ballroom instructor at Jewell. This was just the start of Seaborn’s involvement with the program. “There were very few of us who were interested, but me and one other male started dancing together a lot. We loved it [and] did very well. When I graduated, I lived three blocks away, worked a full-time job during the day and at night came here and I danced…I never left,” said Seaborn. For both instructors, ballroom dance has had an impact on their life. “I’ve personally been teaching ballroom dance for over 30 years. It’s a great partnership, it’s great for couples, it’s a great social event. The benefits are just amazing. Healthwise, it’s good for you. It’s a good way for kids to interact with one another with no pressure,” said Mickle. Like Fross, Seaborn was involved with the team for the majority of her time at Jewell. “I learned I was a natural, I was good at it, and it made me feel good about myself. I went from the shy little nobody to a teacher and a fairly confident person, lost a bunch of weight thanks to it. It just changed my life,” said Seaborn. During Seaborn’s time at Jewell, the team had two members. It has since grown to around ten members, creating a tight-knit group. “I enjoy the people I meet, too, because some of them I would never have met otherwise because we are all in such different spheres,” said Fross. “The dance community is very small, it’s very tight-knit and very very welcoming to anybody, whether you’re here for a day or for the rest of your life, it’s the most welcoming place to be,” said Seaborn. To see the team in action, head down to the Mabee Center April 18. The team will be performing around 9:20 p.m. The event is free to all Jewell students, $5 for community members and no dance experience is required. Photos credits to Christina Kirk.